Introducing our newest gun product, the I Series. Why "I" you ask? Because each rifle is individually made to the specifications and measurements of the purchaser. Fenris Wolf Arms in Red Oak, Oklahoma, is proud of our ingenious design allowing for complete disassembly with the pull on a single pin. This innovative new series offers interchangeable barrels. This special feature saves you money while allowing one rifle to fill numerous shooting niches without filling up the gun safe. Choose from calibers ranging from .22RF Hornet to .500 Nitro Express, with rimless calibers in barreled action or cased set form. In a world of one size fits all, mediocrity, and plastic, the handmade artistry of our Fenris Wolf rifles is an investment in American invention and craftsmanship. Our rifles are reasonably priced without an inordinate wait. 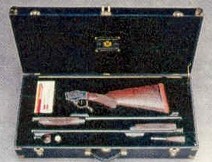 The "I" series is available in several styles ranging from Western to Express rifle to Schuetzen. Your toughest decision is deciding on which degree of embellishment you desire. Embellishment options may be applied in various degrees of completion, from action, barreled action, and completed cased set. Contact us today to order an I series rifle for your collection.